Two thugs used pitchforks to attack another man during what a judge described as a 'falling out among thieves'. Paul Frain and Sam Richardson attacked their victim in broad daylight in the car park of a convenience store, leaving him with several puncture wounds, Teesside Crown Court heard. "The victim and a friend were driving through Wingate in County Durham in January this year," said Andrew Findlay, prosecuting. "He stopped at a convenience store, and his passenger got out to go into the store. 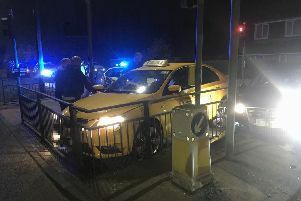 "A car driven by Frain pulled up, as did another car driven by Sam Richardson, blocking in the victim's car. "Both men get out and set about the victim with pitchforks, prodding him through the open driver's door window. "He tried to fend them off, and tried to wind up the window, which was smashed by one of the men with pitchforks. "There is no medical evidence in this case, but the victim suffered a number of puncture wounds." The court heard the victim and his family have since moved from Wingate. "They went to Scotland," said Mr Findlay. "The victim says he was homeless for a time, living in a caravan with his wife and three children. "He says he lost his business in Wingate, and has been unable to get it going again. "His children were distressed to see him in his injured state, and they still refer to it months later." Frain 51, of Thorpe Road, Easington, and Richardson, 27, of Woodland View, Wingate, admitted unlawful wounding on January 5. Stephen Constantine, defending Frain, said there was a feud between him and the victim. "Mr Frain was fearful when he noticed the victim following him," said Mr Constantine. He said Frain thought there was no point calling the police, so he called Richardson. Mr Constantine added: "What happened went way further than either of them anticipated." The court heard Frain has been on a curfew for most of this year, which would count five months towards a prison sentence. David Lamb, for Richardson, said his client had spent 10 months in prison on remand. "The court may feel he need not serve any longer for this offence," said Mr Lamb. Judge Peter Armstrong sentenced Frain to a curfew of another two months, and jailed Richardson for 15 months. The judge said: "This could be said to be a falling out among criminals which is not of great concern to wider society. "But it was an attack with weapons, during the day, in the street, so cannot be ignored. "The appropriate sentence for you, Frain, would mean you would only serve a month or so in custody, taking into account the time you have already spent on a curfew. "Richardson's record is worse, but I have concluded he need not serve any more time. "The sooner the pair of you put this behind you, the better."